The kids were playing outside late one afternoon earlier this week when I saw the bats come out of our roof. (I never let them outside on their own. The vervet monkeys and baboons are not scared of children and my children are not scared of them which is potentially quite dangerous, so I am always outside with them. Not that they are too scared of me, but that is another story altogether;-) We know the bats live up in our roof, along with a family of squirrels and probably some other critters. It is something that comes with the territory of living here I guess and we don’t mind them. The squirrels leave the roof during the day and come in before the sun sets, a little later the bats leave for the night. Almost like a tag team occupation in the ceiling above our heads. We can hear the bats during the day though. And I have noticed over the past few months that we were hearing them a lot more. And as I was watching them fly out, I realised why. There are dozens and dozens of them! I could hear them making their way to the exit in the ridge of the roof and it almost looked like they were all so eager to get out, they sort of got stuck right at the exit half of their bodies sticking out, until one of them breaks free and the rest of them can follow in waves and waves until they have all left for the night. I did not realise we had this many bats in the roof again. After what happened in 2014, I thought they had all moved out, but I was clearly mistaken. Back in 2014, I was still working for KLM, commuting back and forth between Joburg and Amsterdam, trying to spend as much time as possible with Steven in Letaba. We also had lots and lots of bats in our roof then, but they seemed to concentrate more in the ceiling above our bedroom than the living room where they are now. I am pretty sure they have always lived in the roof of this house and all of our neighbour’s roofs in the staff village as well. During one of my visits, I noticed that the crown moulding between the ceiling and the walls was coming away at certain places. And a fine, brown dust was falling down. This got worse and worse over the next few months. I even noticed that the ceiling was starting to sag a little bit. We reported the bat problem to the maintenance department, but they were so understaffed that they could only do crisis management and not preventative maintenance. So no one unfortunately ever got round to vacating the bats out of the roof and cleaning up there. Because that fine, brown dust was actually bat poop, that was up there and the ceiling sagging, was coming away under the sheer weight of the bat poop that had accumulated up there for many, many years. I remember when I left Letaba to drive back to Johannesburg to get to Amsterdam for a flight duty to Nairobi, I told Steven I was worried that the ceiling might actually come down altogether if all that bat poop would stay there. One of the maintenance guys came to have a look and he quickly agreed that something needed to happen soon. Stevens brother and sister in law were visiting and went on trail with Steven after I left. I was in Nairobi when he sent me a message. It wasn’t even a message, but just a photograph. My jaw dropped when I saw what was on that picture. Steven had come back from trail that morning and wanted to put his bags in the bedroom. Before he even opened the door he could already smell it. Bat poop, and lots of it. When he got inside and had a closer look, there it was. What we had feared had actually happened… the ceiling had collapsed onto our bed. The whole room was a gigantic mess of ceiling- and insulation material, bat poop and bats. It was a catastrophe. Or rather a batastrophe! The ceiling that gave way onder the weight of the bat poop. Now the maintenance department was in full on crisis management mode. They carried our bed, my stunning new linen, lamps, butler trays, everything outside. When they had a look up there, it was clear that there was lots more bat poop on top of the ceilings of the other two bedrooms as well. All the ceilings needed to come out and the bat poop needed to be shovelled out. In the other two bedrooms, they put down plastic tarps, before taking the ceilings down. Unfortunately, in our bedroom, the damage to the carpets had already been done. Bat poop came out of our house in bucket loads. Easily 30 years worth of takes your breath away stinky bat poop! The house was completely inhabitable. So Steven moved into a bungalow in Letaba rest camp while they were busy sorting out the ceilings and cleaning up. I joined him there after I returned to SA from my flight to Nairobi. We actually didn’t mind. It was a bit like being on holiday in our own camp! The carpet in our bedroom was still full of the fine dusty bat guano after the contractors that put in the new ceilings had left. So they sent in a company to clean the carpets for us. Luigat Cleaners. And boy did they live up to that name! May I give you a word of advice? Whenever something similar happens to you (and I sincerely hope it won’t) Don’t make the same mistake these people made with our carpet! Please hoover up all the poop with an industrial vacuum cleaner first before you start washing the carpet! Because they started with that. They brought in the wet wash machine, instantly transforming the carpet in a bat poopy, muddy mess. They rinsed, hoovered, rinsed again, and repeated the whole process many times. But when they left, there was still so much bat poop in the carpet, that we had dung beetles move into our bedroom!! Oh my word!!! What an experience – how lucky you were that you were not at the time in the bed . . . .I hope all your special bed linen and other furniture was not ruined. It makes a great story and the pics really underline the poopy situation. Living in the bush -sigh – magic- but maybe sometimes enough to drive you – er- bats. We are off to Kruger tomorrow so will catch up on your blog when we get back. Have a lovely holiday in Kruger! I cannot think of anything worse…Good job you weren’t in bed when the ceiling came down..Now that would have been a batastrophe…. Sjoh ja, imagine that!! That would have been a disaster!! Thanks again Linda. Here’s hoping your house is nice and clean now, and you can move back in. Although I know the bungalows in Letaba are lovely. It is also not terribly healthy for people so a good thing that they were eventually FORCED to clean it all out. Ah but living in the African wilds always has those risks. This is a horrible story. Haha. I love bats and I love having them close, but they can indeed be messy and smelly creatures. Your story made me think of a bat experience my husband and I had while managing a game farm in the Eastern Freestate Our whole house was full of flying bats in an error while trying to seal up the roof and making a one way valve for them to exit. But luckily no poop all over the floor. Good luck this time round. 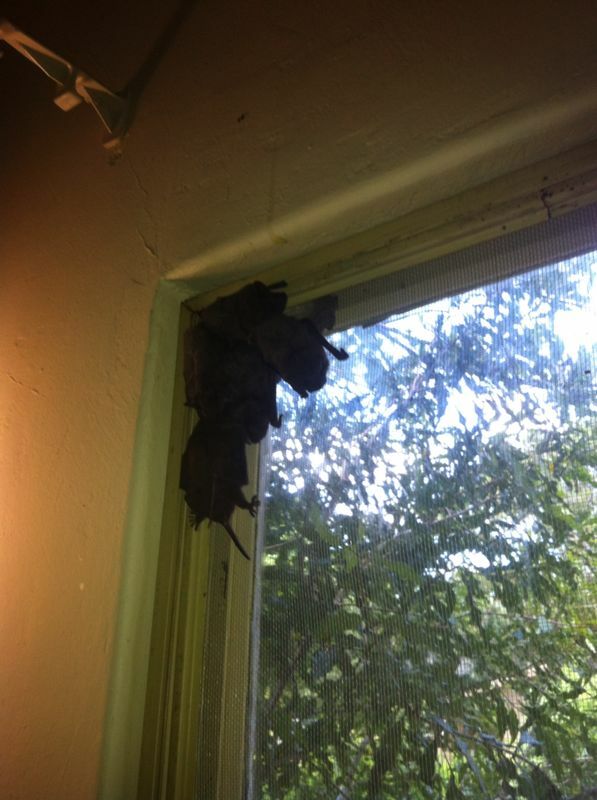 I hope you can make a plan with the bats in your house without harming them.